With only days to go before I get my Canon 550D (I’m choosing that over the 7D so I can use my SDHC cards), I’m filling in the waiting time with final little checks and shopping lists of things I really shouldn’t buy yet, things I do need to buy, things to go and shoot for testing purposes. This, at the expense of proper work at times. As I packed up after a shoot yesterday, I got thinking… If I shoot voxpops at around 30% of the zoom range, talking heads up to around 50%, presentations at 80-90%, and I have a 0.6x wide angle converter, what does this all mean in the language of a Video DSLR like the Canon 7D and 550D? What lens(es) do I need to cover myself if that were the sole camera? So I got to work with a Spreadsheet. It’s not a comparison I’ve seen whilst doing my research, so I thought I’d share. It’s quite illuminating for someone such as I. 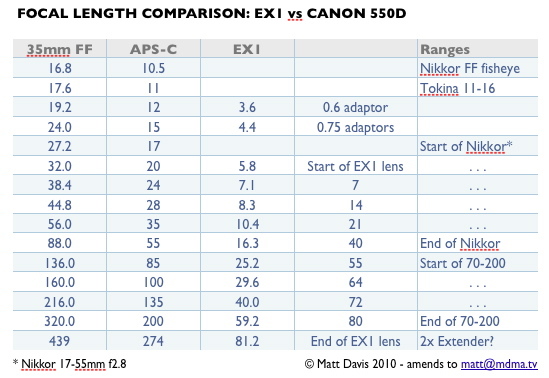 If it’s popular, I’ll keep it updated with any corrections and maybe add 1/3″ and 2/3″ cameras in there. But for now, I have some lenses to buy. Just back from the Broadcast show (BVE2010? ), where I participated on a panel hosted by Rick Young about the future of video, alongside luminaries Larry Jordan, Christina and David Fox. We debated various topics and I hope it will be up on MacVideo.TV soon. But as always in these situations, I’ve come out of the room and had a little time to reflect on what we said, and now I’m spending the evening slapping my forehead and muttering ‘Should have said that’, ‘should have mentioned this’ and ‘why did I open my stupid gob about the other?’ and so to end this circle of grumblings of ‘Oh and another thing’, here’s what I wanted to add now that I’ve thought about it properly. So we were talking about what should we be shooting on and editing with over time? Generally, shooting formats do not make good editing formats, editing formats do not make good delivery formats. So choose the right codec for the job, and think about things like NanoFlash which separate your codec choice from your camera choice. Weigh up the time taken to do a ‘virtual telecine’ of footage to an editable format versus the instant gratification but sometimes long term toil of editing in your shooting format. Flash was once king of web delivery but – shock, horror – not supported by iPhone and iPad. Be ready to convert assets to H.264, or even Ogg at this rate. Or Dirac. Or maybe even Microsoft’s VC1, the codec almost, but not entirely, unlike MPEG4. Above all, codecs are like vegetables – they come in and go out of season. Keep an eye on this and keep high quality masters of stuff you want to keep. If you want to keep them for decades, consider lossless or near lossless (like PhotoJPEG) and be prepared to transcode in the future. There seemed to be a bit of apathy about live events coming to internet video. Which I find odd. If we’re to roll over and say that the idea of tuning in at 8PM to watch a show is ‘over’ and everyone is using PVRs, then surely the concept of Broadcaster is dead? Of course not, and don’t forget the big things Broadcast does well: Live. Leaving aside whether it’s good or not, live broadcast TV does things like News, Sport, Spectacle and Entertainment unlike anything else. It has to be live, it has to be big and of course it’s hard to ignore the ads. Has anyone tried to use the web during a big news event? It grinds to a halt, no video works, everything is clogged up. So if the internet is to perform the same trick, it needs to know how to do broadcast: video on the web using a broadcast protocol. Yes, yes, this is already possible in closed Microsoft networks, but not on the internet. Not yet, anyway. Serendipity: a post on a BBC blog with an interesting point of view. Web video will probably be people’s first taste of ‘High Definition’, now that YouTube, Vimeo and the rest are firmly ensconced in 720p land. Better than broadcast (well, okay, not really, but stick with me for a while), on demand, wide range of stuff. So why is it so hard to watch on your lovely expensive living room TV? Sure, Apple TV was supposed to fix that but somehow never got there. Storage manufacturers are having a go, but of course you have to crack your DRM to use it. But for Pete’s sake, check out how quickly any desire to watch stuff – originally on your computer – on your big plasma, rapidly turns into a High School Engineering project. HDMI has been hobbled to prevent you using a computer to play DVDs and BluRay discs, or you find the sound is missing, or it’s the wrong resolution or shape, or we’re scaling when it’s not necessary. Then there’s the dumbness over HD – buy a movie from iTunes and you get something of lower resolution and lower functionality than if one purchased the DVD, and often it costs more than Amazon. Like that’s going to build an industry. Don’t get me started. Fibre is as fast as the boxes at either end. Peer to peer (even if within the ISP level) could be the next intelligent proxy service for large files, but because P2P = piracy = end of the world, your bandwidth is being shaped. Oh no, not up… Down. Throttles occur. Want those throttles lifted? Pay. This is divisive. Companies are rationing out, not implementing more. Growth builds business, but growth doesn’t mean dividing the cake into ever smaller units. But really, I am ranting now. Technology suffers greatly from hype. The Cheap DV Revolution had a huge dose of hype, everyone got bored of it and suddenly DVCAM ousted BetaSP whilst nobody was looking. The same thing happened with HD – Changing the world as we knew it, fell a bit flat and nothing more was said in the consumer world. Suddenly there’s a million HD subscribers (though we’re still talking the test phase). This big initial hit of enthusiasm, followed by a rapid tailing off of interest until there’s a trough of disillusionment then hides a slow and steady growth of that technology until it reaches ubiquity and invisibility as it delivers the promises once made at the peak of the hype cycle. So we’ve started that slow climb out of disillusionment with HD, I predict the plunge of DSLRs into that trough sometime soon, and 3d is climbing up that cycle. We’ve done digital, gone tapeless. Still a lot of work to do on HD. We’re nowhere near done on that. DSLRs will have a brief moment in the sun like their DoF Adaptors before them, but will they remain indie film maker tools once Scarlet and a new Hybrid hit the market? 3D is in its infancy. Will it come? Sure, along with VHD, but unless you have big big bucks, I’d still shoot long-life material in good HD rather than half-finished 3D formats. But we need to play and to test – how will motion graphics or even simple tummy tags work in 3D? And these are just three of my little rumblings from the afternoon’s panel – I’ll probably chew it over for ages. I hope, at least, the audience got a basketful of things to think about.